Poppy Stamps craft die featuring a deer. 2.3 x 1.3 inches, 5.8 x 3.3 centimeters. Poppystamps craft die featuring a small otter. Hero Arts dies featuring a red panda and a dragonfly. Hero Arts Frame Cuts are designed to perfectly pair with their coordinating stamps so you can add architectural form and tidy framing to your cardmaking, stamping projects, and more. They are made of solid metal construction with a sharp and durable cutting edge. Universally compatible, they are engineered to easily to align around your stamped images and stay strong enough to cut through most stamping media. This CottageCutz die features a Moose. CottageCutz are thin metal dies, like a QuicKutz. They are easy-to-use and add great detail to any craft project. This die is compatible with the following machines: QuicKutz Squeeze, Revolution, Sizzix / Ellison Big Shot, BigKick, CuttleBug, SpellBinder Wizard and Accucut Zip'eMate. Adapters/shim may be required on some machines. Made in the USA. 100% lead free. This darling lamb is absolutely adorable. His head and body come seperate, so you can pose him in a few different ways. Try embossing the body with a swirly embossing folder, or flocking it for added texture. You can also snip away the tuft on the top of his head easily to give him white fleece with a black face, and do the same with the end of his paws. Approximate size: 2.4" x 2.9" assembled. Wildlife themed Memory Box craft die featuring a Fancy Deer in a Circle. 100% steel craft die from Memory Box. For use on cardstock, felt, and fabric. Cut, stencil, emboss, create. Use in most leading die cut systems. Wildlife themed Poppystamps craft die featuring a deer. 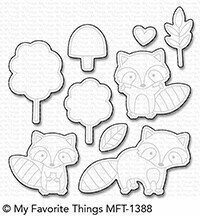 This Die-namics coordinates with the Friendly Raccoons stamp set for perfectly sized die cuts every time. It is open inside to allow you to stamp then cut OR cut then stamp. This feature makes the Die-namics lighter weight and allows for easier removal from the die. This 9 piece set includes: Standing raccoon 1 1/2" x 1 3/8", Standing raccoon with arms spread 1 5/8" x 1 1/2", Raccoon on four legs 2 3/8" x 1 1/2", Large tree 1 1/8" x 1 3/4", Small tree 1" x 1 3/8", Mushroom 13/16" x 1", Single leaf 7/16" x 3/4", Foliage 5/8" x 1 1/4", Heart 1/2" x 7/16". Crafty-Ann craft die featuring a sheep. Size: 3" x 2" (76mm x 50mm). Wildlife themed craft die featuring a Moose. Steel cutting die from Elizabeth Craft Designs. Compatible with most leading die-cutting machines. Craft die from Stampendous featuring 2 adorable llamas, 1 with glasses and 1 without. 3 precision, stainless steel dies that leave a narrow border around each image. This Die-namics coordinates with the Playful Giraffes stamp set for perfectly sized die cuts every time. It is open inside to allow you to stamp then cut OR cut then stamp. This feature makes the Die-namics lighter weight and allows for easier removal from the die. This 3 piece set includes: Forward-facing giraffe 7/8" x 2 7/8", Right-facing giraffe 1 3/4" x 3 1/8", Left-facing giraffe 1 3/4" x 3". Craft die featuring a sheep. Memory Box/Poppy Stamps craft dies are made of 100% steel. For use on cardstock, felt, and fabric. Cut, stencil, emboss, create! Use in most leading die cut systems. 1.3 x 1.7 inches sheep, 0.5 x 0.3 inch ears. Poppystamps craft die featuring squirrels. Memory Box/Poppy Stamps craft dies are made of 100% steel. For use on cardstock, felt, and fabric. Cut, stencil, emboss, create! Use in most leading die cut systems. Craft dies featuring a trio of animals. American-made, precision-etched metal dies create perfect cut-outs using your favorite cutting machine. Craft die from Impression Obsession featuring ocean waves, seagulls, sea shells, and more! Christmas themed craft die Sara Davies featuring a deer. Die size is approximately 2.8" x 3.6" (71mm x 90mm). This majestic deer duo will find their way onto your cards and projects throughout the season. Whether you craft a Christmas sleigh-pulling dream team or pair these regal beasts with a bright red cardinal in a snowy winter scene, you'll find endless ways to incorporate them into your designs. MFT Die-namics, our very own exclusive American-made line of steel dies. Die-namics dies work with your favorite die-cutting machine. This Die-namics coordinates with the Jungle Vibes stamp set for perfectly sized die cuts every time. It is open inside to allow you to stamp then cut OR cut then stamp. This feature makes the Die-namics lighter weight and allows for easier removal from the die. This 9 piece set includes: Monkey 1 1/4" x 1 1/2", Elephant 1 3/4" x 1 7/8", Zebras (2) 1 1/8" x 1 7/8", 1 1/8" x 1 5/8", Lion 1 3/8" x 1 7/8", Tree 1 3/4" x 1 3/4", Grass 5/8" x 7/16", Notes (2) 7/16" x 1/2", 5/16" x 7/16". MFT Die-namics dies are our very own EXCLUSIVE, American made line of steel dies. This Die-namics coordinates with the Safari Party stamp set for perfectly sized die cuts every time. It is open inside to allow you to stamp then cut OR cut then stamp. This feature makes the Die-namics lighter weight and allows for easier removal from the die. This 10 piece set includes: bear 1 3/4" x 2 1/4", turtle 1 3/8" x 7/8", rhinoceros 2 1/8" x 1 1/2", elephant 2 1/4" x 1 7/8", snake 3/4" x 1 1/8", alligator 2 1/8" x 7/8", zebra 1 5/8" x 1 7/8", top hat 5/8" x 5/8", large bow tie 7/16" x 1/4", small bow tie 5/16" x 3/16". MFT Die-namics, our very own exclusive American-made line of steel dies. Die-namics dies work with your favorite die-cutting machine. 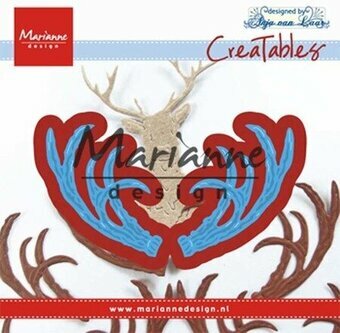 The Collectables is the newest series of Marianne Design. These are dies that you can combine with the matching stamps or the special dies that you can use with paper or felt. The dies are of the same well known high quality as the Creatables series and thanks to the unique designs even more versatile. They are lovely products that allow you to use all your creativity. Naturally these dies can be used in many of the machines. Zebra friend for the elephant and giraffe or use the die to make a donkey on the farm. 13 pcs; 4 x 2.9 in. Impression Obsession craft die featuring an elephant. These are US-made steel dies compatible with most table-top die cutting machines. This is a set of 4 dies. The elephant measures 3-1/4 x 3-3/4 inches. Kiki the Koala measures 2.625" x 3". With his sweet gaze, he is ready for your koala-ty card! Our darling llama (who also looks like an alpaca.... so you choose!) is ready for his travels through your craft room. We had to name him Lorenzo, of course! He measures 2" x 3", and is perfect for creating those on-trend cards for many occasions. Craft die from Memory Box featuring a deer and pine trees. 3.3 x 3.2 inches, 8.4 x 8.1 centimeters. Memory Box craft die featuring a Running Elk. 3.2 x 3.2 inches. This adorable sheep craft die from Impression Obsession is a set of 13 dies. The assembled sheep measures 2-1/2 x 2-3/4 inches. Compatible with most table-top die cutting machines. Ping is our cute and cuddly panda bear, just sitting back, as sweet as can be. Ping measures 2.8" x 3.5". Poppystamps craft die featuring a fox. 0.9 x 1 inch. Redd, the fox, will measure 2" x 1.875" when assembled. You can pose his head in different directions to give him an inquisitive look if you wish. He's small enough for tags. Isn't he cute as can be? Penny Black Creative Die featuring animals including an elephant and a giraffe. This is a set of 4 dies, three squirrels and a cluster of 3 acorns. The squirrels are 5/8" x 1-1/2", 7/8" x 1-1/8", and 1-1/8" x 1-1/2". Craft die featuring a deer. Tattered Lace Dies - Fawn. Detailed and delicate, Tattered Lace Dies are the most intricate dies available. This topper die gives you the perfect finishing touch to all of your projects. This die measures approx 1 3/4"x 2 9/16". Wildlife themed Poppystamps craft die featuring squirrels. Craft die from Impression Obsession featuring a giraffe. This is a set of 4 dies. The giraffe is approximately 3 x 4-3/8 inches. These are US-made steel dies compatible with most table-top die cutting machines. Introducing the Rococo Die - Adorable Elephants. For those who are expecting a new addition to the Family. Large Elephant: 60x88mm, Small Elephant: 39x52mm. Farm themed stamp and die set featuring a cow, a horse, pigs, chickens, and more. This coordinating set includes dies and stamps. Stamp first and then cut out using the matching die and a die-cutting machine. Create a variety of projects from cards, gift tags and more. Dies are compatible with most brands of die-cutting machines. Adapters and shims may be required on some machines. Made in the USA and 100% lead-free. Craft die featuring a Fox and a Raccoon. CottageCutz are thin metal dies, like a QuicKutz. They are easy-to-use and add great detail to any craft project. They are universal and easy to use with the following machines: Sizzix Big Shot, Sizzix BIGkick, Provo Craft Cuttlebug, Spellbinders Wizard, Spellbinders Grand Calibur, QuicKutz Revolution and QuicKutz Epic. Adapters/shim may be required on some machines. Made in the USA. 100% lead free. Craft die featuring a tree, a bear, a fox, and an owl. CottageCutz are thin metal dies, like a QuicKutz. They are easy-to-use and add great detail to any craft project. They are universal and easy to use with the following machines: Sizzix Big Shot, Sizzix BIGkick, Provo Craft Cuttlebug, Spellbinders Wizard, Spellbinders Grand Calibur, QuicKutz Revolution and QuicKutz Epic. Adapters/shim may be required on some machines. Made in the USA. 100% lead free.